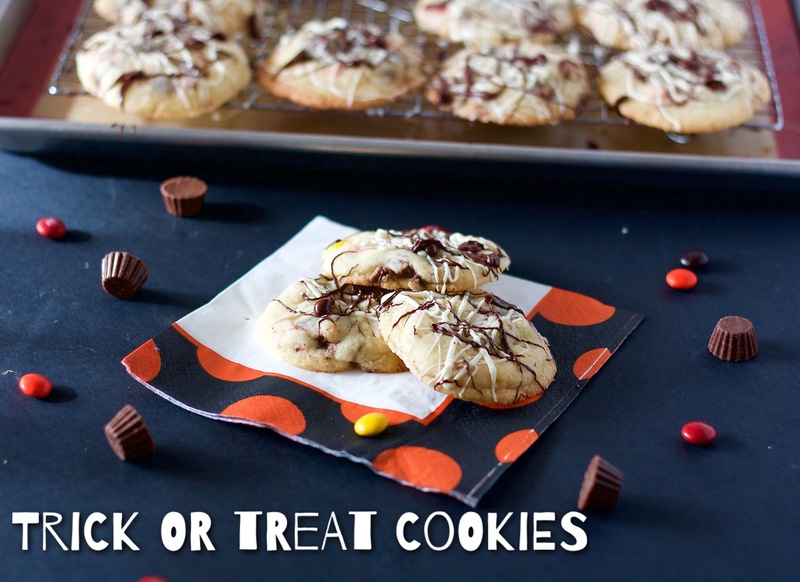 Trick or Treat Cookies are a perfect solution to all of that leftover Halloween candy. Now that I’m too old to pass as a trick or treater, my Halloween highlights consist of admiring the creativity and general adorableness of the trick or treaters who come to my door. Living in a semi-rural area, those trick or treaters are few and far between. We’ve lived in our house 5 years and I think our record high is 5 trick or treaters. BUT. Our light is on! And we buy candy as if we’ll have 100 trick or treaters! So please, please, please, if you are in the neighborhood, come to my house with your princess, ghoul or goblin and I promise handful after handful of good candy. No tootsie rolls, pinky swear. Inevitably, no matter how generously we dole out the candy, we are left with a veritable mountain of the stuff. Like, we’re still picking through it come Valentine’s Day. These cookies are my solution to that problem…or situation. I don’t know that excess candy is every really a problem. However you look at it, these cookies are a delicious way to use up all of the extra Halloween candy laying around once November hits. They’re so yummy that you could probably convince your kiddos to sacrifice some of their hard-earned loot to the cause. That just means you’ll have to share. Start with a soft and chewy sugar cookie base and add a few handfuls of some leftover candy chopped into bite sized pieces. I highly recommend using chocolate based candy for this recipe, but if you want to be a trailblazer and put Starbursts in your cookies, be my guest. The white and semi-sweet chocolate drizzles on top of the cookies are completely optional, but I think they add a fun air of both decadence and seasonality to the cookies. I think they look a little bit like really delicious spiderwebs. These cookies are super versatile. In the coming months the recipe can be repurposed for Thanksgiving and Christmas, depending on your add-ins. But let’s take one holiday at a time. I hope you and your family have a fabulous and not-too-spooky Halloween! A great way to use up leftover Halloween candy! Preheat oven to 375. Line two rimmed baking sheets with either parchment paper or silicone baking mats. In bowl of stand mixer, cream butter and sugar together on medium speed until light and fluffy, about 3 minutes. Reduce speed to low and add egg and egg yolk and vanilla. Slowly add flour mixture in 3 batches, allowing each addition to become incorporated before adding the next. Turn off mixer and add candy. Briefly mix on low speed to distribute candy throughout dough. Roll dough into balls (about 2 Tbsp per cookie) and place on baking sheet. You should get about 24 cookies total. Bake 14-16 minutes, rotating sheets halfway through, until edges are lightly brown. Cool cookies on sheer for about 5 minutes, then move to baking racks to cool completely. Once cookies are cooled, melt white and semi sweet chocolate one at a time. To melt chocolate, either use double boiler or microwave on 50% power for 1 1/2 minutes. If chocolate is not melted after 1 1/2 minutes in microwave, heat at 30 second intervals, stirring after each. Use fork to drizzle chocolate over cookies.